Solid and reliable performance from a budget-priced service, but bear in mind that there's no P2P support. 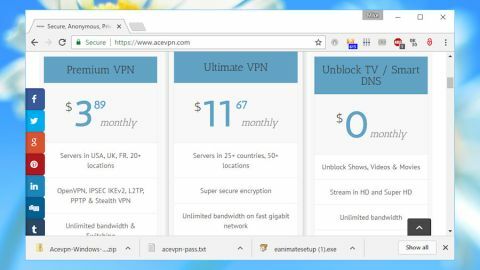 Pay a visit to Acevpn's website and you'll immediately notice the headline price: a monthly $3.89 (£3.20, AU$5.33) for the Premium VPN product. Really? Sounds impressive. The service specs aren't too bad – no torrents, but unlimited bandwidth and 20+ servers in three countries (US, UK and France), wide protocol support, Smart DNS proxy to unlock streaming sites – but we quickly spotted something strange. Why was the service priced at $4.58 (£3.75, AU$6.30) on another page, and $5.95 (£4.90, AU$8.20) on the purchase page? It turns out that the $3.89 per month only applies if you pay up-front for a three-year subscription, something which isn't mentioned on the front page. The one year equivalent was $4.58, and a one-off month was $5.95, 50% more than the misleading headline price. It's a similar story with the companion Ultimate VPN plan. This extends the offering with 50+ locations in 25+ countries and allows torrents, but once again, the headline $11.67 (£9.50, AU$16) monthly price only applies for a three-year subscription. One-off months are $15 (£12.25, AU$20.60), and the equivalent for an annual subscription is a relatively expensive $13.75 per month (£11.25, AU$18.85). If you're looking for good value in your VPN – or indeed a website you can trust – then this could be the point where you decide to head off elsewhere, but we stuck around to delve a little deeper. Acevpn has a short but clear statement on logging: "We do not spy on our users and we don't monitor their internet usage." It doesn't provide any information on data collected for session logins. The company has an unusual ‘transparency report’ on "the governmental requests it has received to disclose information about our customers." This states that the firm has never been served a warrant, or had any searches or seizures, or turned over any SSL keys, installed a back door on their network, "terminated a customer or taken down content due to political pressure" or "provided any organisation a feed of our customers’ content transiting our network." We're unsure whether this covers everything you might want to know. And it doesn't help that the company says this will be updated quarterly, but the current version is dated April 30, 2016, more than 8 months ago. Still, it's more information than you'll get with many competitors, and that's always welcome. While checking out the small-print we noticed a couple of interesting refund-related points. The good: there don't appear to be any conditions, other than you must apply within seven days. The bad: there's a $1 ‘processing fee’, so it's essentially a ‘most-of-your-money-back guarantee’. Once we were online, performance was very acceptable in our tests*. Our short distance tests had little effect on speeds, with latency up by around 22%, uploads 90% of normal, and download speeds around 80% of our regular rates. Switching to our UK-US test made surprisingly little difference to the results. Latency and upload speeds were broadly the same, and although downloads dropped to around two-thirds of normal, they were still typically 20Mbps or more. We were testing the ‘budget’ Premium VPN plan, so there are some restrictions – in particular, no torrents. But upgrading to Ultimate VPN allows P2P and adds more servers, potentially improving performance. Acevpn Premium isn't quite such a good deal as the company makes out on the front page of the site, but you're still paying less than most for a consistently speedy service. Just beware, there's no torrent support: that needs the much more expensive Ultimate plan.